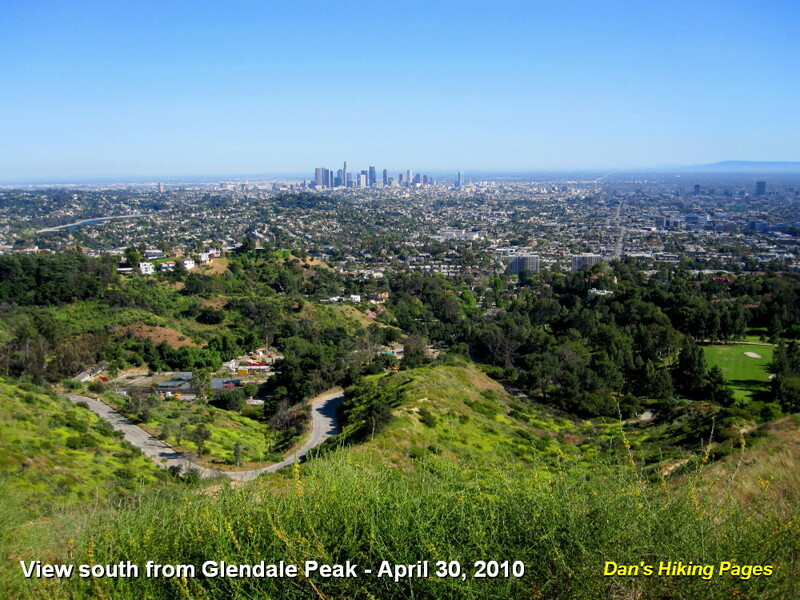 Standing in the southeast portion of Griffith Park, the often overlooked Glendale Peak offers a moderately easy destination with rewarding views over the vast human sprawl of Los Angeles to the south and Glendale to the east. And there is a good chance that you'll have the peak to yourself as the vast majority of walkers ignore it. A highlight of the hike is leaving the wide dirt road and following Henry's Trail to the summit. The sign reads, "Henry's Trail, Glendale Pk., In memory of Henry Shamma, 9/93." John McKinney writes that Shamma was a popular Sierra Club leader "who delighted in leading hiking groups to the summit and sharing the fabulous views." 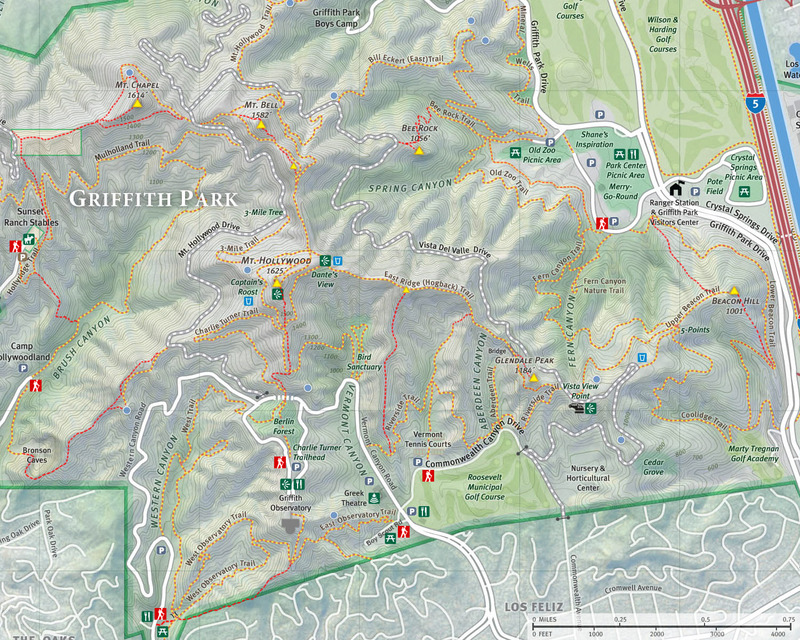 Shamma loved Griffith Park and worked tirelessly to maintain its gardens and trails. If you are up for a longer hike, you can continue up Hogback Trail to Mt. Hollywood (another mile) and descend one of several routes to make a nice loop. 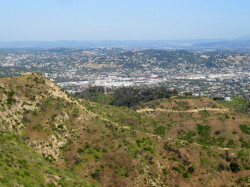 Griffith Park is northwest of downtown Los Angeles, just west of I-5, roughly between Los Feliz Blvd. to the south and the Ventura Freeway (SR 134) to the north. From Los Feliz Blvd. turn north on Vermont Avenue and drive along a scenic street lined with regal mansions. At about 0.7 miles, just past the golf course restaurant on the right, turn right on Commonwealth Canyon Drive (If you pass the Greek Theater, you've gone a half block too far). 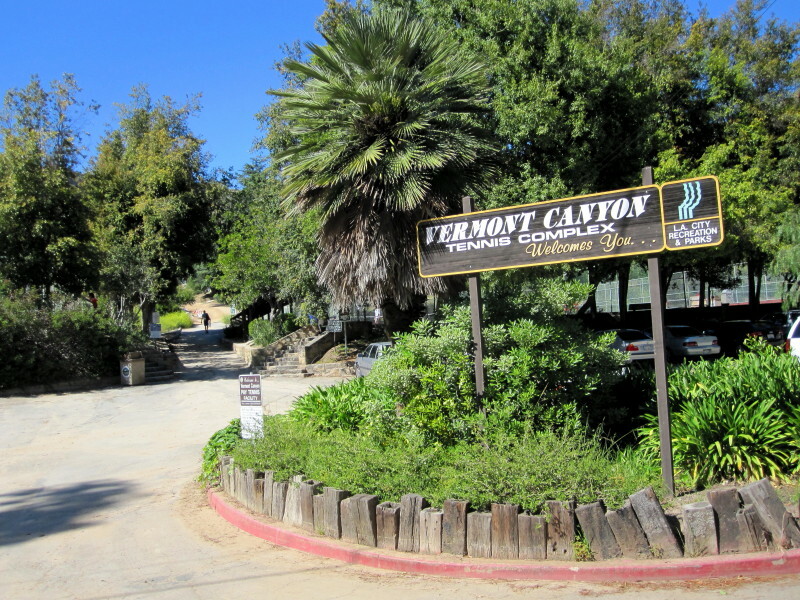 Drive 0.15 mile to Vermont Canyon Tennis Complex and turn left into the parking lot and park. From the tennis courts parking lot, walk north on the broad path through the tennis courts and up the heart of the unnamed canyon. This whole area was incinerated with the May 2007 fire and is gradually recovering. Straight ahead notice the prominent high point on the ridge. This is what has become informally referred to as Hogback Peak and is a potential destination if you want to extend the hike. At 0.25 mile you reach a junction with Riverside Trail (referred to as Aberdeen Trail on some older maps and trail guides). Straight ahead is a use path that leads to a steep climb up the canyon wall to Hogback Ridge (see number one under Other Routes below). 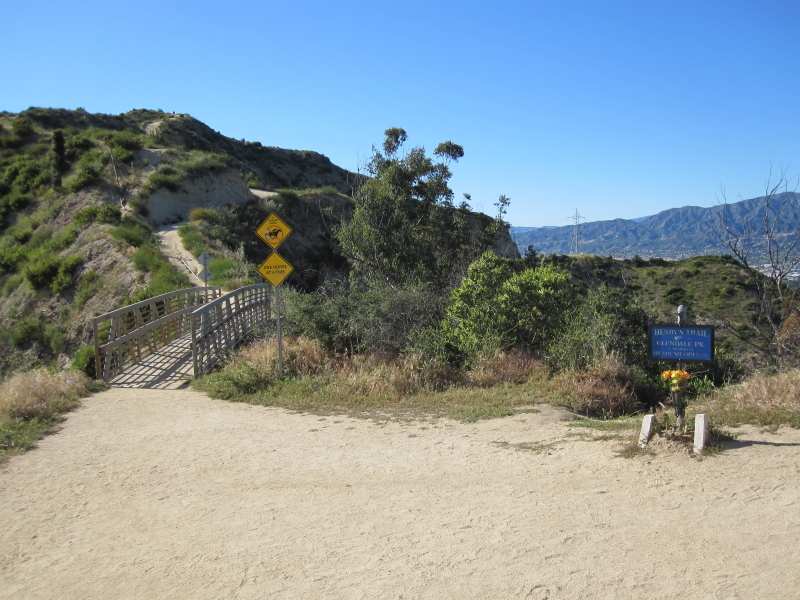 To the left, Riverside Trail climbs up and over to Vermont Canyon Road to a trailhead that sits about halfway between the Greek Theatre and Bird Sanctuary. If you are doing the entire loop to Mt. Hollywood, this would be an optional return route from Vermont Canyon. Turn right (east) and follow Riverside Trail (a wide dirt road) as it climbs southeast. Soon you’ll see Griffith Observatory on the ridge to the southwest and views south toward the L.A. sprawl. The trail contours around an outward bend northeast and dips into Aberdeen Canyon. Looking straight ahead you see Glendale Peak with a road cut traversing its flank. If you look carefully you can see the bridge at the saddle to the left of the peak. Soon you pass a side trail to the right that connects with Commonwealth Canyon Drive (post 5) in about 30 yards. To the left, Aberdeen Trail heads north into the canyon. Stay straight on Riverside Trail and begin to climb again. In a few more minutes contour around another outward bend with your first view northeast toward Vista Del Valle Drive. Keep climbing and at about 1.0 mile from the start you reach the junction of Hogback Trail (aka East Ridge Trail) and in a few more steps, the paved Vista Del Valle Drive. Turn a sharp left at the green pump shed (a sign next to the shed says "Bridle Trail") and head west on Hogback Trail (another dirt road) along the south flank of Glendale Peak. Soon it curves around north and Mt. Hollywood comes into view to the west. In a few more minutes you reach a bridge and sign on the right indicating Henry's Trail. Turn right onto the narrow path and climb southeast along the broad ridge to the summit of Glendale Peak. From the summit enjoy the views. The named peaks in the park which can be seen from here include Beacon Hill (1001’) to the east and Mt. Hollywood (1925’) to the west. You can also see “Hogback Peak” standing tall on Hogback ridge to the west. Return the way you came or see alternate routes below. The summit of Mt. Hollywood draws probably more visitors than any other peak in Griffith Park, except for maybe Mt. Lee. It can be approached from many routes. To make a nice loop and achieve the highest summit in the heart of the park, consider this route. Return via Henry's Trail to the bridge. Turn right, cross the bridge and climb northwest up Hogback Ridge. You will be treated with splendid views south and north. There are places where the trail is somewhat steep with slippery footing. En route you can scamper to the top of Hogback Peak (1480') for a great panorama. Continue up Hogback Trail, pass Dante’s View (stay right at the junction) and in a couple more minutes arrive at a 4-point junction northeast of Mt. Hollywood (0.9 mile from Henry’s Trail). Turn left (south) and walk another 0.2 mile to the summit of Mt. Hollywood (1625’). To continue the loop, you will want to arrive at the 5-point junction south of Mt. Hollywood. Take either route from the north side of the summit that curves around to the south, or take the use path south straight down from the summit (steep and slippery in places) (The 4.4 mile loop total is based on the use path. If you take the the road options that skirt the west or east flanks of Mt. Hollywood, add about 0.75 mile to your total). Once at the 5-point junction south of Mt. Hollywood, notice the two paths heading south. Take the one on the right which descends south along the west flank of the ridge. Shortly the trail curves around to the east and begins to wind its way into the upper reaches of Vermont Canyon, passes the Bird Sanctuary, and terminates at Vermont Canyon Road. Follow the road 0.4 mile to Commonwealth Canyon Drive, turn left (northeast) and walk 0.15 mile to your car. Of if you prefer on your return, you can use Riverside Trail. 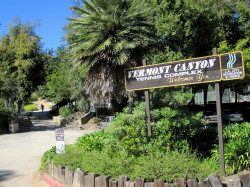 Its trailhead sits about halfway between the Greek Theatre and Bird Sanctuary on Vermont Canyon Road. For a more complete description of the routes around Mt. Hollywood, see my Mt. Hollywood hike description. From Glendale Peak - If you like short cuts, notice a path heading east from the summit. This heads toward the junction of Riverside Trail and Vista Del Valle Drive. Unfortunately, as it nears the junction, it drops precipitously down the face of the granite road cut. I do not recommend this route. You’ll also notice a path heading south. This route is somewhat steep with loose footing and requires climbing down a steep rock face to arrive on Hogback Trail. It is doable if you are so inclined. 1) From the trailhead, walk north 0.25 mile to the junction with Riverside Trail. A right turn would take you along Riverside Trail as per the regular route described above. For an alternate route, continue straight ahead on the use path that leads up into the canyon. After a few minutes the route bends right and climbs the steep canyon wall to Hogback Ridge. From here you can turn right (east) and descend to Glendale Peak, or turn left (west) and ascend to Mt. Hollywood. Or you can use this route on your return trip. See my blog post for a hike heading up that route: Mt. Bell and Mt. 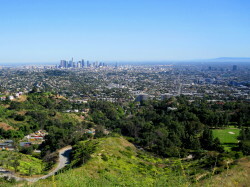 Hollywood via Commonwealth Canyon and Hogback Ridge - October 6, 2011. 2) There is a use path that follows the ascending/descending ridge from Hogback Peak (1480') south to Riverside Trail (0.6 mile with 440 feet elevation change), intersecting the trail between Vermont Canyon and the tennis court canyon. The upper portion is crazy steep and only for those with billygoat skills. 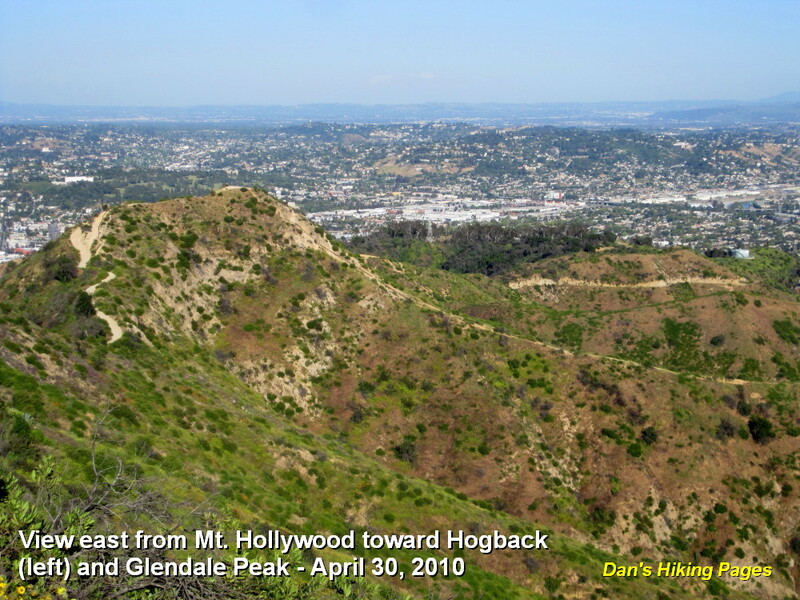 See my blog post for a hike heading up that route: Hogback, Glendale, Beacon via Vermont Canyon - February 17, 2012. 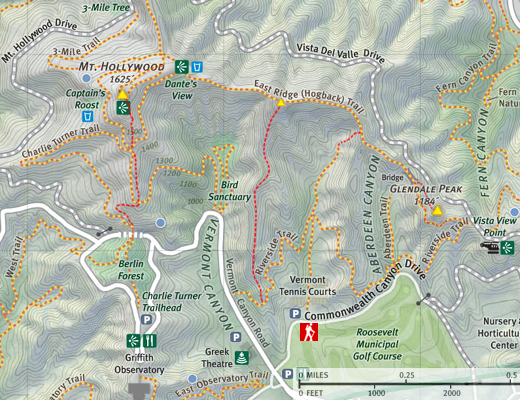 Elevation Gain - The difference between the trailhead (780’) and Glendale Peak (1184’) is 404 feet. The roller coaster action climbing out of Aberdeen Canyon both ways is about 240 feet total. Thus the total round trip gain to Glendale Peak is 644. For the total loop hike to Mt. Hollywood, the difference between the trailhead (780’) and the Mt. Hollywood (1625’) is 845 feet. Then add 120 feet for the climb out of Aberdeen Canyon (one way) and 65 feet for the climb to Glendale Peak from the bridge (since we have to regain that elevation on Hogback). Thus the total loop trip gain is 1,030. If you scamper up Hogback Peak in route, add another 25 feet. Dogs must be on leash at all times - This is the law. City ordnance (LAMC 63.44-B,2.C) requires dog owners to keep their dogs on a lease in the park except in designated areas. This ordinance is clearly communicated throughout the park. Los Angeles County: A Day Hiker's Guide - by John McKinney (The Trailmaster: Santa Barbara, 2006). "Glendale Peak." Good background and hike description of the 2.5-mile round trip hike with 500 feet in elevation gain ascending from the tennis courts on Commonwealth. Helpful line map. Same hike as Stone (below). Day Hikes in the Santa Monica Mountains - by Robert Stone (Day Hikes Books: Red Lodge, 2012). Hike 8: "Glendale Peak from Riverside Trail." Brief background and good hike description of a 2.8-mile round trip hike with 400 feet in gain ascending from the tennis courts on Commonwealth. Helpful line map. Same hike as McKinney (above).